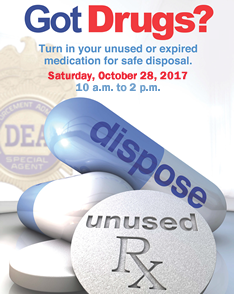 Continuing in the effort to combat opioid abuse, the Township of Randolph will be participating in the Morris County Prescription Drug Take Back Day on Saturday, October 28, 2017 from 10:00 a.m. to 2:00 p.m. Residents can anonymously and confidentially drop off unwanted or expired prescription medications in front of the ACME at 690 Millbrook Avenue (on the corner of Sussex Turnpike). Doing so eliminates drugs that can fall into the wrong hands. The project, sponsored by the Drug Enforcement Administration (DEA) of the U.S. Justice Department, has proved very popular—last year, the DEA reported collecting almost 900,000 pounds of unwanted medicines around the country.